Poor, sad, pitiful me. I lost my Mojo a couple of months back. I was moping around, sleeping too much, couldn’t concentrate, no pep in my step. To the rescue: My good friend, Rene! The postman delivered a box FULL of Mojo straight from her door to mine: What seemed like hundreds of little curled strips of paper with the word “MOJO” in various colors! What a clever pick me up!!! 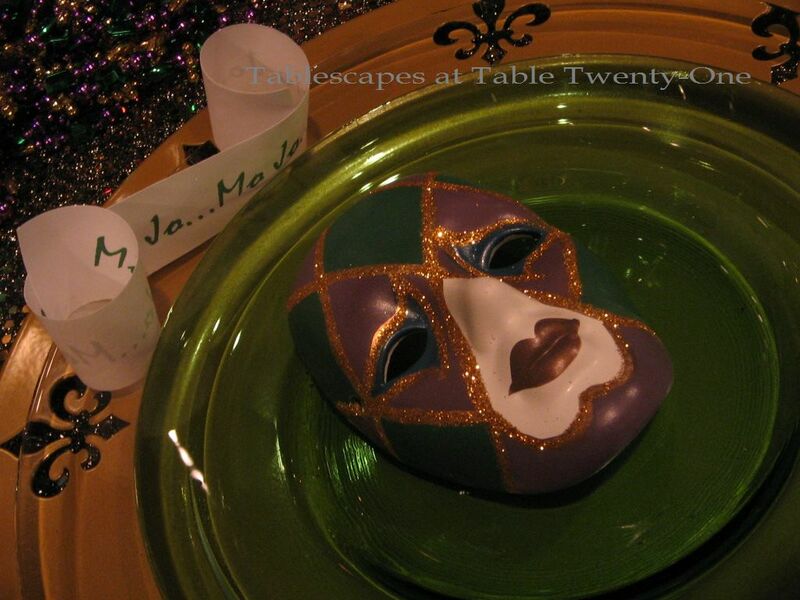 So to that end, I dedicate our Mardi Gras tablescape from this past weekend to my sweet friend, Rene. Thanks for helping me get me Mojo back! With just four of us to celebrate the weekend before Fat Tuesday, the space in front of the fireplace seemed just right. 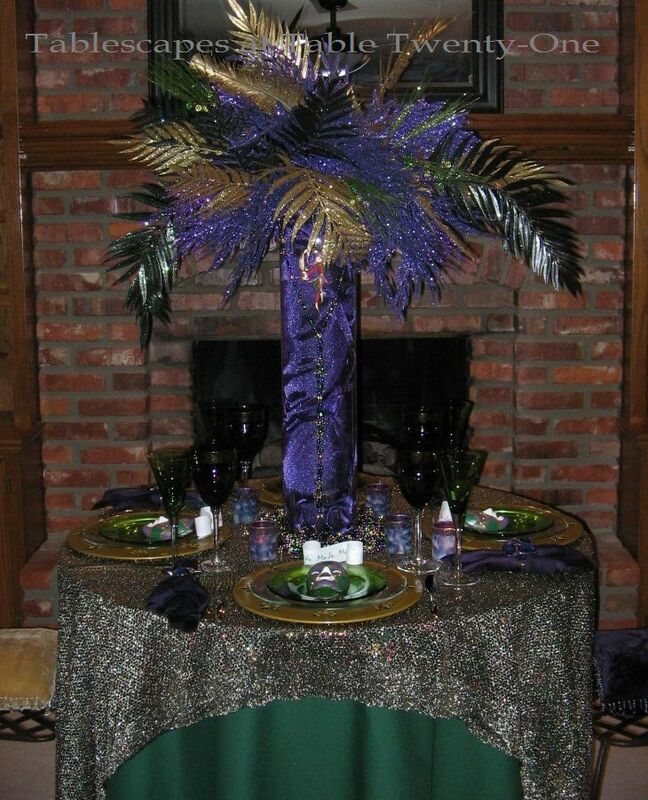 I wanted to have as much sparkle and shine and decadence as possible for this tiny table to make it really stand out. I started with these gold fleur de lis chargers I bought at Tuesday Morning 10+ years ago. They don’t get much use, but they sure are fun! 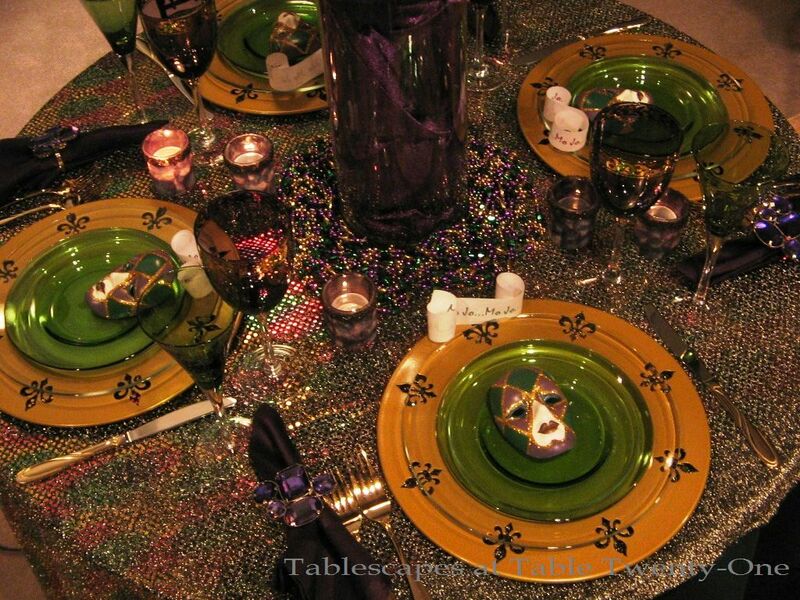 To allow the fleur de lis design to stand out, I chose clear dinner plates and see-through green salad plates. Of course, goldtone flatware was in order. 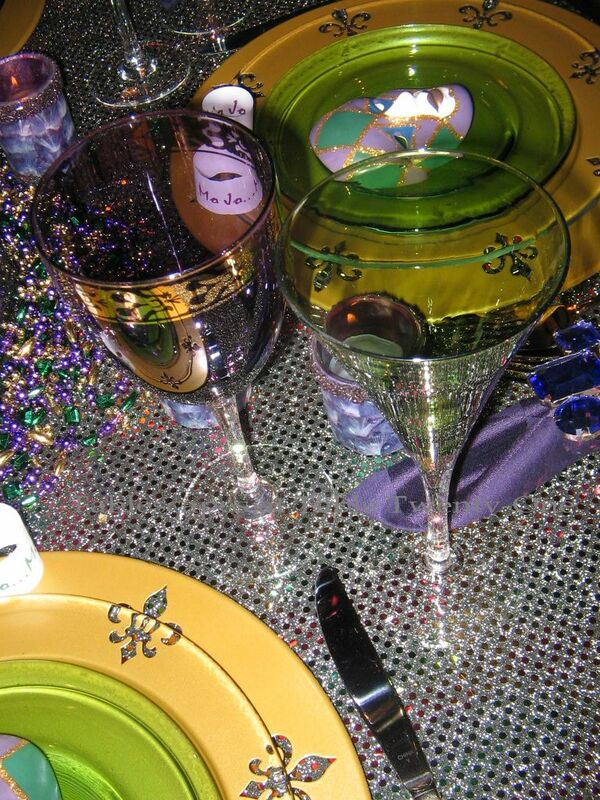 Keeping with the standard Mardi Gras colors of purple, green and gold, I chose purple stemware with gold embellishment for the water glass and a brilliant emerald green wine glass, both purchased from Pier 1 about 7 or 8 years ago. The clear stems give them a cohesive look. 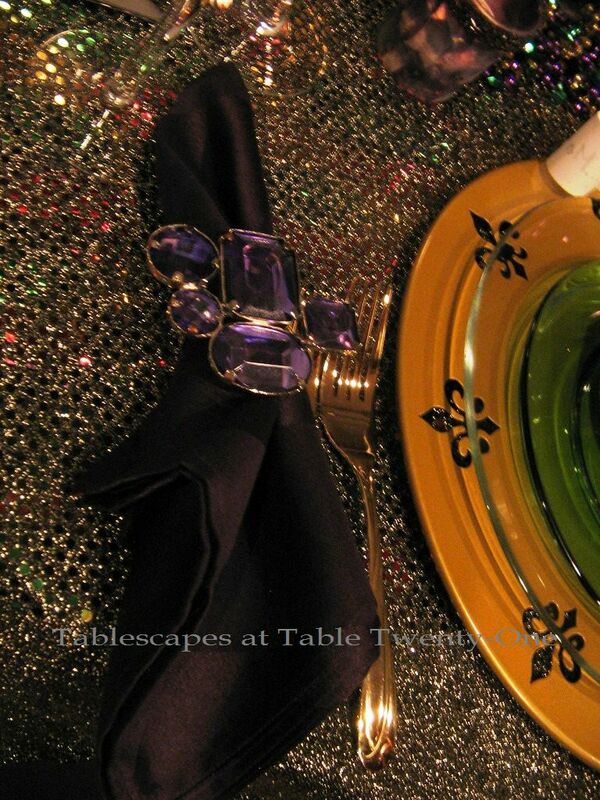 Cotton napkins in a rich aubergine are gathered with these fabulous jewled napkin rings from Z Gallerie. Hard to tell by the picture here, but they have a fabulous color-on-color Harlequin design. I bought these painted Harlequin ceramic masks from the clearance bin at Tuesday Morning about ten years ago. Ah! My motivation! They make a perfect little embellishment at each place setting! 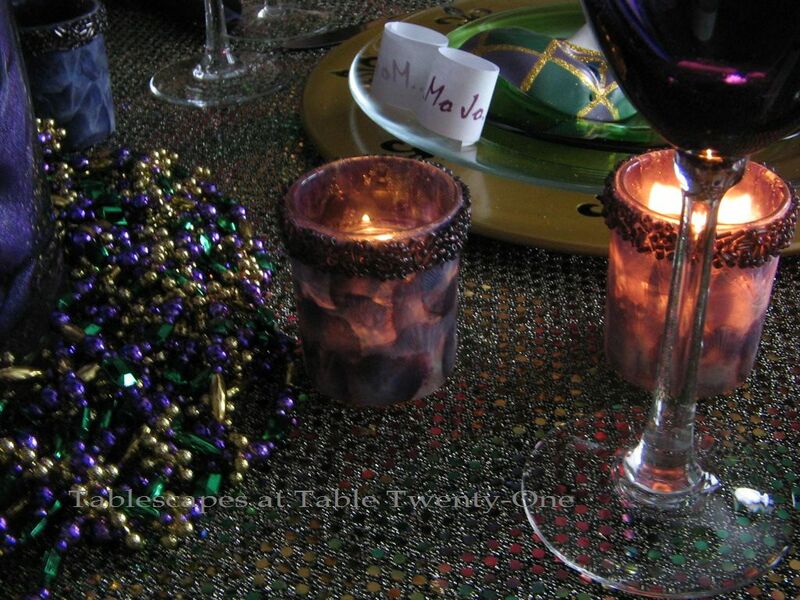 Inexpensive multi-colored sequinned fabric works great as a table topper over a deep green full-length linen. 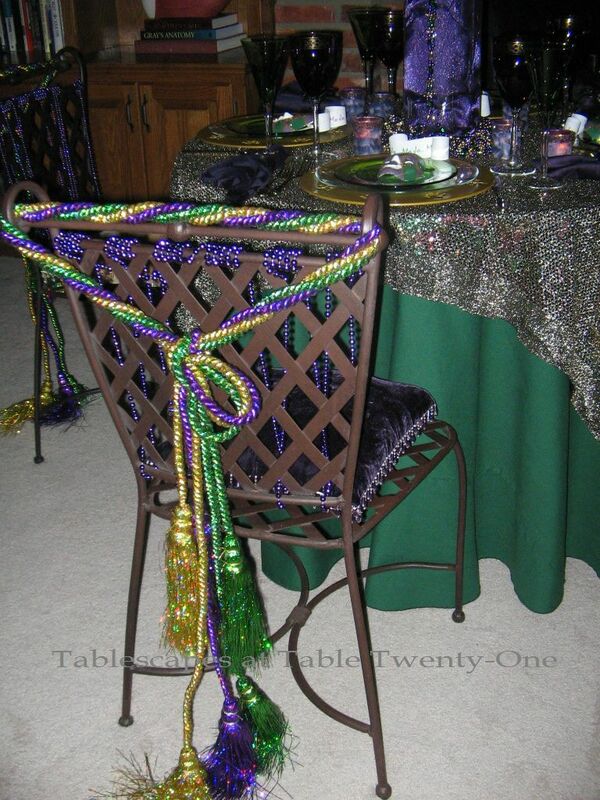 Something kind of fun was to use these sturdy iron chairs loaded down with fun Mardi Gras-inspired decor. 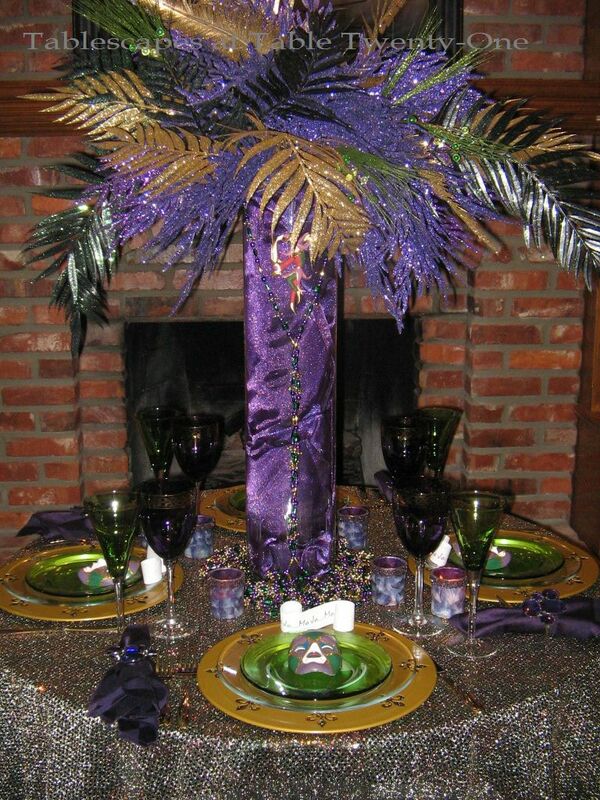 Each chair received a beaded seat pillow, purple for the gentlemen and gold (of course!) for the ladies! These votive holders are covered in purple feathers (yes, feathers!) and finished off with a band of pretty beads at the top. So here’s a lesson in “I don’t have any extra money to spare but need the right color vase”101. I took a clear glass cylinder and gently mounded yards of shimmering purple organza into it. I LOVE the effect! It seems to give the vase movement and depth as well as the intended color change. 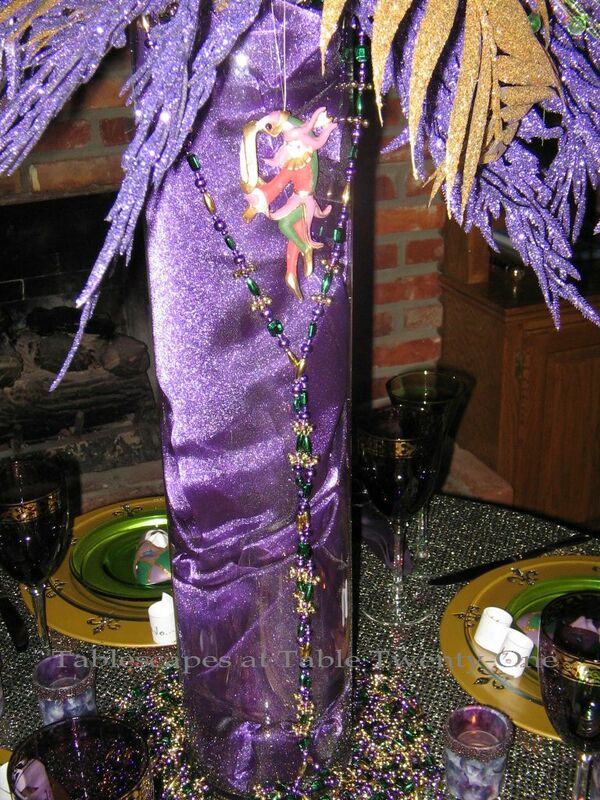 A 6-ft. length of purple, green & gold bead garland drapes from the top of the vase, tucked just inside the rim, all the way down into a pool of Mardi Gras beads. I’ve pulled back the feathers to better expose the Harlequin ornament (a 25 cent after-Christmas purchase from Tuesday Morning) that merrily dances on the side of the centerpiece. 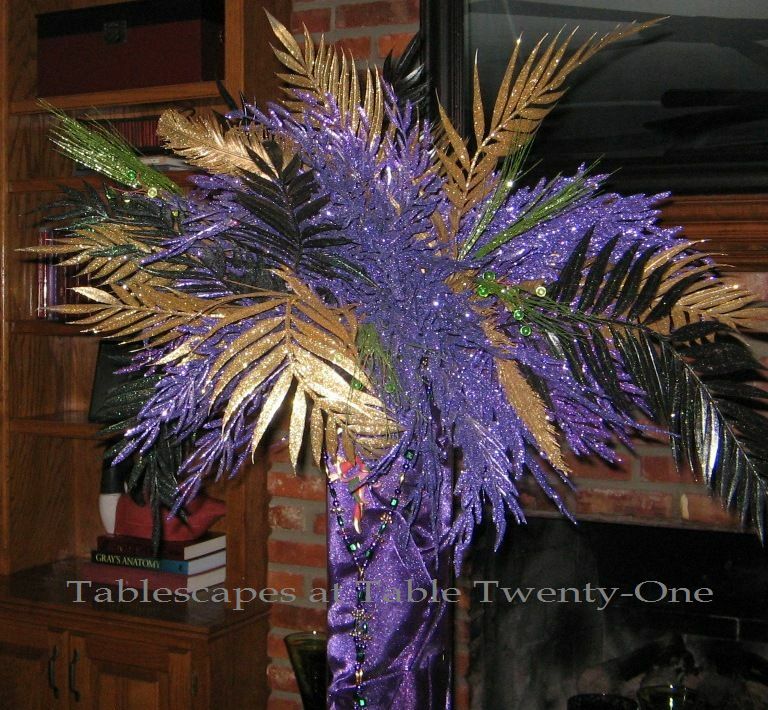 The crown of the centerpiece is this exquisite profusion of purple, green and gold glittered feathers. (When there’s no money in the budget for flowers, feathers are a great stand-in!) I just started tucking them in, and the end result was what looks to me like one of those Sunday-go-to-meeting hats some of the fancy ladies wear! Our meal for this occasion was a shrimp boil. I had something completely different planned and already printed on the menus, but our dishwasher went on the fritz a few hours before our guests arrived. It was then a choice to either use (and have to wash by hand) 5 or 6 pots for the original menu or just switch to the one-pot-Wonder. I think I made the right choice! 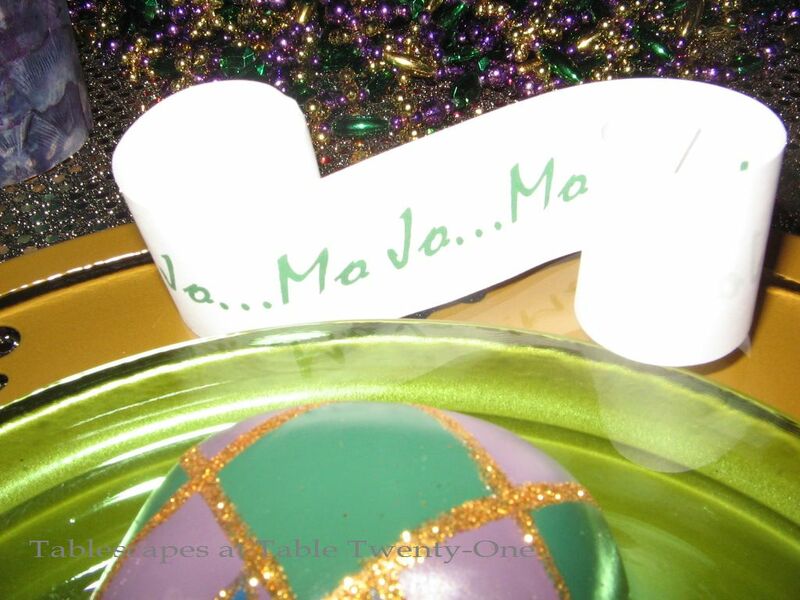 Have a Fabulous Fat Tuesday, everyone! Fan-tabulous. or should I say Fun-tastic!!!! Love it, love it, love it. Purplicious! I am green with envy and you take the gold! What a great fun table. I hadn’t noticed you lost your mojo, not with the great tables you have been showing us! Thanks so much for sharing your creation, and not tacky at all. It’s for Mardi Gras! Okay, the feathers rock! Loving the colors of them and the cylinder with wads of fabric.. Now that is above clever. Your selected plates and glassware are perfect. I love those fleur de lis chargers! I used a piece of fabric myself this week, it’s so much fun and so easy to find the right pieces. Love your chair covers and the decor on them as well. Great table. Glad your mojo is flowing again. Hi, Marlis! With gasoline and groceries prices (especially produce!) going through the roof, my husband has put the brakes on my spending. I’m having to get really creative. I take it as a challenge! 🙂 I’ve had those feathers for a long, long time but never had a chance to use them. Creativity is born of relative “poverty”, I suppose! Same applies to the vase…no time to search for a reasonably priced one that was tall enough, so the organza I bought to make an overlay had to suffice! I’m cooking up a storm right now for tomorrow’s party. The house smells so good!!! I’ll talk to you on Wednesday! Have fun tomorrow! I can’t imagine you losing your Mojo…you certainly have it now! I love this festive & cozy table for four! So many great details…your chargers are wonderful, I love the reflection in your purple stem! 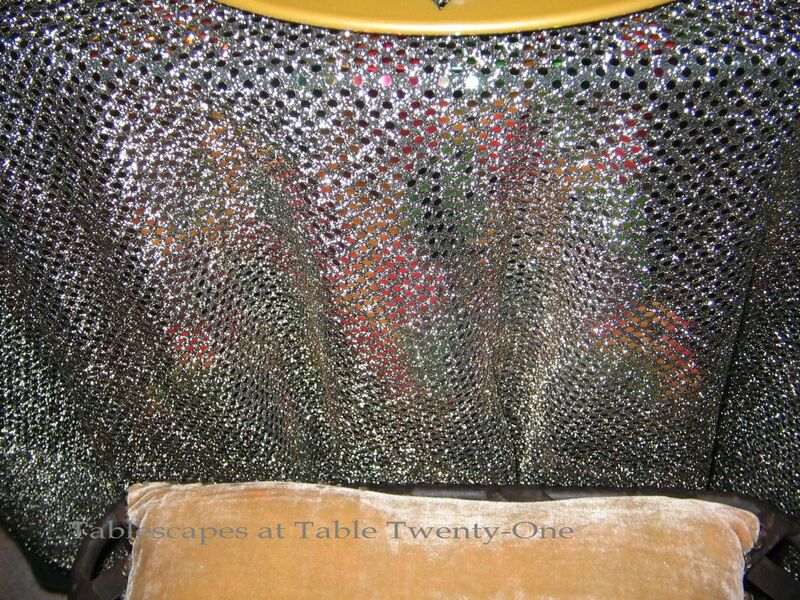 Your beaded chair seats & ties are so fun. Sorry about your dishwasher~ a shrimp boil is a one-pot-wonder, I sure it was delish! Hooray! I’m glad you liked it!!! Whenever I need a little pick-me-up, I go to my Mojo box & put a strip in my pocket. I then have to discard that one at the end of the day since I’ve sucked all the Mojo out of it! The last couple of months have been rough, so I’m down to only about 11 more strips! Spring is ’round the corner, though, so hopefully my “natural Mojo” will bloom, too! Thanks so much for getting me through this winter!!! I love you, too!!! In this fabulous setting, I can just taste the luscious gumbo, beignets, bread pudding with rum sauce, and oh! don’t forget the “hurricanes”!!!!!!!!!!!!!!!!!!! Hurricanes!!! That’s what I forgot! Rats!!! Maybe next year! 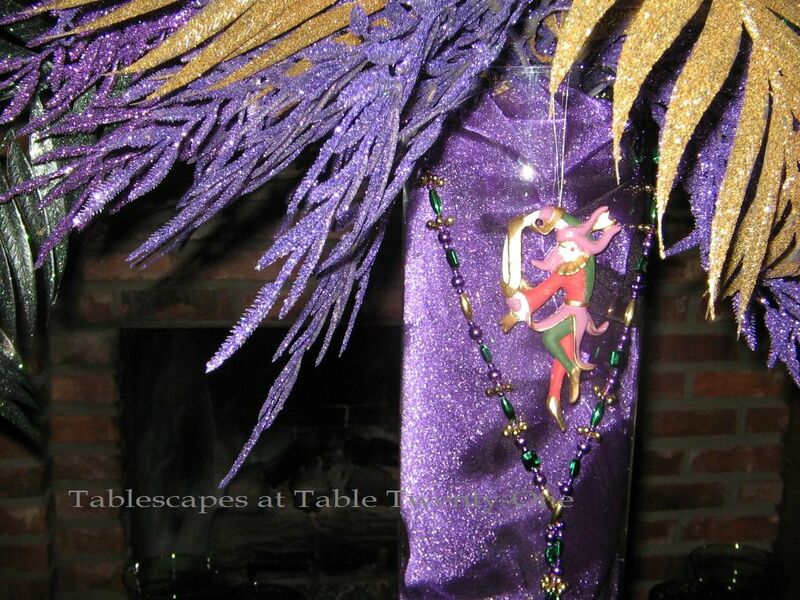 I love the colors of Mardi Gras, so find this table with its magnificent centerpiece to be quite dramatic, but those individual Harlequin masks really send me. Great job!